I remember when I first came across this recipe and I thought, “kiwi salsa verde…whaaaat?” It sounded very strange, but also very enticing. I mean, I love kiwi and I love salsa verde so, why not?? 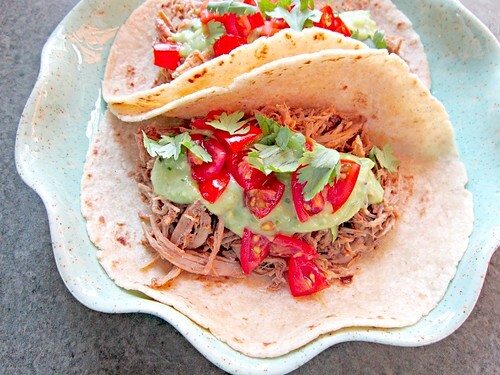 And the jerked sriracha pulled pork – what’s not to love about that?? And with the new programmable crock-pot that we got as a wedding gift, it’s become so much easier to start dinner before I leave for work and it be done and still warm (but not still cooking or burning to a crisp) when we get home in the evening. Crock-pots (slow cookers, whatever you call them) in general are amazing, but when you’re gone for 10+ hours a day, the programmable one is really where it’s at. I made a few changes from the original recipe, but the concept is still fundamentally the same. 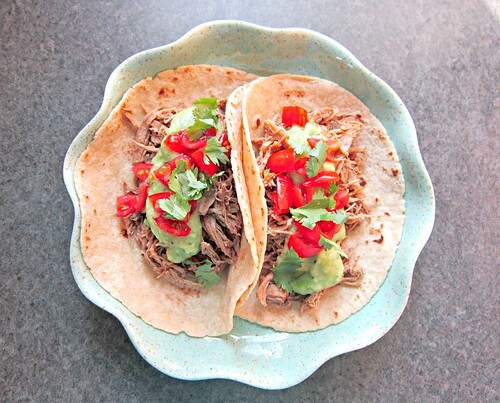 Slow-cooked pork with jerk seasonings, topped with a Greek yogurt, avocado, kiwi, jalapeno, and lime salsa verde sauce. It’s so simple to throw together and so full of flavor! Now, I’ll be honest…I didn’t originally intend for the salsa verde to be a creamy version with Greek yogurt and avocado. But, when I tasted it and it sent my taste-buds to the fiery depths of hell, I knew I had to do something to cool it off a bit. Jalapenos are fickle little peppers. Sneaky, sneaky with their spiciness. I added notes below, but do be careful with them…remove the seeds and add one at a time, to get your desired level of heat. If you like it mega spicy, then throw caution to the wind and just toss those babies in the food processor seeds and all..but be prepared! I wasn’t sure if the kiwi would shine through with all the other components of the salsa, but I could still taste it just fine – even through the hell-fire spiciness. I wouldn’t quite say it added a sweetness, but something along those lines. It was a nice contrast to the other spicy and creamy components. Overall, J and I both really enjoyed these tacos. Hell, I even used the pork and the salsa to make “green eggs and ham” for breakfast one morning! Combine all of the ingredients for the pork (except for the pork) in a blender, and blend until smooth. Place the pork in your crock-pot and pour the blended mixture on top. Cook on high for 3-4 hours or low for 6-7 hours. Pork will shred easily with 2 forks when done. Shred and then cook for an additional 10 minutes so the juices can soak into the shredded pork really well. Meanwhile, make your salsa by combining all of the ingredients together in a blender or food processor. I suggest adding 1 jalapeno at a time, tasting and then adding more if you want. I used 2 jalapenos, seeds and all, and it just about lit us on fire it was so spicy. So…proceed with caution! 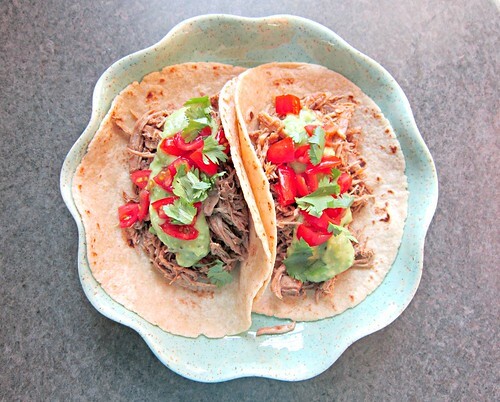 To assemble the tacos, warm your tortillas the top with a little cheese, a few spoonfuls of the pork, then the kiwi avocado salsa verde, tomatoes, and cilantro.